Hi! Today I have a circle lens review from one of my newest sponsors, CircleLens! They sell a wide variety of circle lenses and most come in prescription. Their site is simple and easy to use, and they respond back to emails pretty quickly. Anyway, I got a chance to choose 2 pairs of circle lenses to review for them and today I'll be reviewing the current most popular lenses - Grang Grang Brown which I am wearing below. PS - My blush was PERFECT the day I took this picture. This is what you will receive when you order from them. They provide a contact case and the circle lenses are wrapped in bubble wrap and inside a cute pink box. How it looks like with makeup. I never really know what to say about the design, but I found the design of these circle lenses intimidating. I found it intimidating because of all the hatches and dashes and lines it had. I was afraid that these might look reptile-like on me. It has a brown limbal ring similar to the ones in the GEO honey wing circle lenses. The color is a light brown color. I feel like it's an oak brown when I put it in my eye. It is lighter than my natural eye color and have a reddish hue to it. 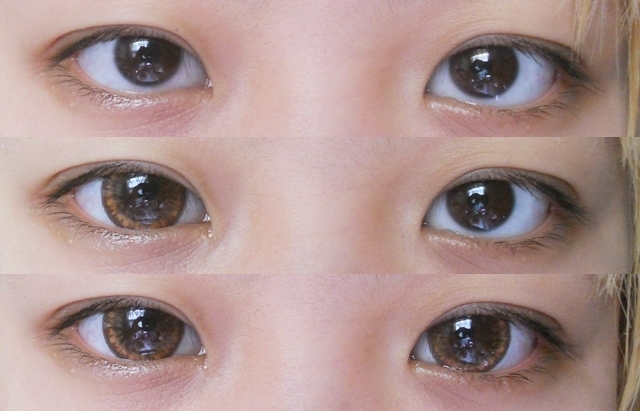 The brown limbal ring makes them really natural and provide a very natural gradation. The gradation reminds me of the Fresh Brown circle lenses I have. These lenses also gives me the halo effect. The vial said these were 15.0mm, however they appear around the same size as the Fresh Brown lenses in my eye. I think it might be because the base curve of these lenses are 8.7 rather than the normal 8.6 ones I'm used to which means it curves more. I actually love the enlargement because it's very natural and it doesn't make me look alien-ish. For the size of these circle lenses, the comfort is great! I can wear them the whole day and my eyes will be fine. However, I did find that these lenses sometimes blur. It might be because of the base curve, but it's usually better after I put in eye drops or blink really hard. Overall, I really like these lenses! These are my back-up lenses for when my Fresh Browns expire. I would have given it 5 starts if the color of the lenses were a bit darker. Maybe the Grang Grang Choco is the one I'm looking for haha. I love that I can wear these as everyday lenses, and it makes my eyes appear dolly without creeping people out. Use my code "uhhsandy" for 10% discount on all items! Comment below if you guys would like to see a comparison post of the Fresh Brown lenses vs Grang Gran Brown lenses. What a very pretty color. And I love the halo effect on this one. But you're right, it doesn't look very enlarging for a lens that boasts 15mm. yeah, but i'm fine with the amount it enlarges. i don't want to be bug-eyed haha. the lens look super natural on you!